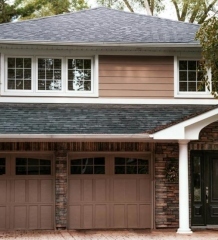 After you’ve found the perfect location for your home office, it’s time to get to work. And so begins the remodeling. Perhaps you’re transforming an old bedroom into an office, or maybe you’ve found an abnormally large closet. Whatever the case, have you considered what color you’d like to paint the room to make it your own? Colors actually have a lasting effect on your mood while you occupy that particular space, so it’s important to choose wisely. 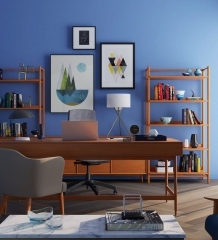 Here are some colors that shouldn’t even be considered when contemplating your home office wall colors. Yellow is one of the worst colors to paint your home office, or any office for that matter. It’s such a vibrant color that it actually tires you out if you spend too much time around it. It’s one of the most attractive colors to the eye, so your eyes would be working overtime, so to speak. On the other hand, since yellow is so appealing, when doing research or noting certain facts in important documents, yellow highlighters are the way to go. Things highlighted in yellow catch our eye so much quicker than words highlighted in any other colors (like blue, green, or pink), so yellow can be beneficial in small doses. When painting your home office, avoid using vivid, bright colors like hot pink or bright green. Bright colors strain the eyes and make it very difficult to concentrate.You’ll be looking everywhere but where you should be focusing. No one wants to feel anxious and on edge when they’re trying to put together a presentation to sell the next hot product to a big name corporation. Remodeling your home office is a grand idea, but what’s not so grand an idea is painting your office a deep purple. It’s said that this shade of purple can bring about romantic feelings, and when you’re left alone in a room with plum-colored walls, your mind is likely to leave earth and go gallivanting across time and space in an alternate reality. The last thing you need when you’ve got a project due in less than 24 hours is to start daydreaming about Emma Watson or Channing Tatum. When you’re remodeling, it is important to keep in mind what sort of work environment you’re looking for to fit your office. If you need a relaxing environment with very little stress or excitement, it would be very beneficial to use pale or earthy tones. These colors won’t stress your eyes or force your eyes to focus on places other than your desk and the work at hand and are ideal for the at-home entrepreneur. It also may be a good idea to choose two colors for the walls in your home office. Perhaps you’d feel more productive with an accent wall. 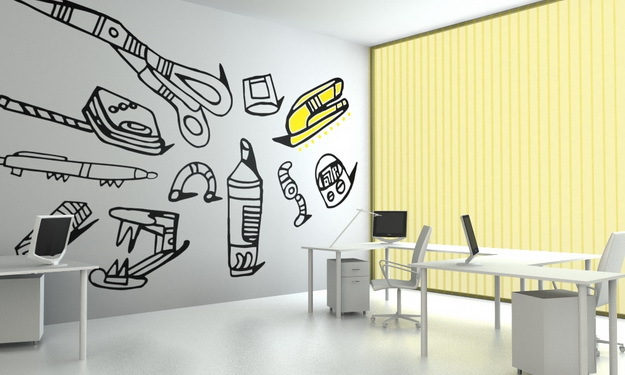 Maybe you plan on painting your office beige but you’re afraid it will look too bland. Try a deep green accent wall for a bit of contrast. For further assistance with choosing a color, visit your local home improvement store. Rose Boettinger provides guest blogging assistance for companies like ComputerDesk.com and Affordable Contracting. Rose loves helping people layout and design their home office. Visit ComputerDesk.com for free shipping on every desk, every day.